Piecemakers Tapestry. Size 24 Tapestry  - $2.26 : Yarn Tree, Your wholesale source for cross stitch supplies. Item 2825. 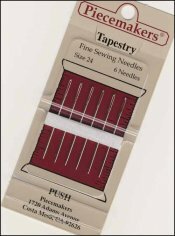 Size 24 Piecemakers Tapestry Needles. A blunt point needle for cross stitch, needlepoint, silk ribbon embroidery, and embroidery on open meshed materials. 1 1/2" long. From Piecemakers. Twelve cards per box, six needles per card. Priced per card. Please order by the number of cards.